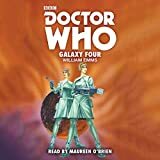 The Doctor, Vicki and Steven arrive on an arid planet in Galaxy 4, where they meet the occupants of two crashed spaceships: the beautiful Drahvins and the hideous Rills (Bill Lodge, Brian Madge, Peter Holmes, David Brewster, voiced by Robert Cartland). Confounding expectations, the latter prove to be friendly, compassionate explorers while the former are a group of mindless cloned soldiers (Marina Martin, Susanna Carroll, Lyn Ashley) terrorised by a warlike matriarch, Maaga (Stephanie Bidmead). Both ships were damaged when the Drahvins precipitated a confrontation in space, but whereas the Rills' is almost ready to take off again - having been repaired by their robot drones, which Vicki names Chumblies (Jimmy Kaye, Angelo Muscat, William Shearer, Pepi Poupee, Tommy Reynolds) - the Drahvins' is irreparable. When the planet is discovered to be on the point of disintegration, Maaga tries to force the time travellers to help her steal the Rills' ship. Instead, the Doctor allows the Rills to draw power from the TARDIS in order to refuel and escape, leaving the Drahvins to their fate.